The recent PMO Symposium presented a fantastic source of ideas and concepts that I am still mentally digesting. As part of that digestion process, I am turning some of my thoughts into blog posts – and probably at some point into presentations. This topic was born as I attended a session on the second day. I realized that I was suffering some mild form of cognitive dissonance. You see, each of the speakers had emphasized the importance of benefits realization – and discussed how true benefits realization really measures the portfolio impact on the strategic goals of the organization. A couple of the speakers emphasized that merely making money, or “sell more, spend less” doesn’t represent a strategy, but really an “outcome” – perhaps an outcome that helps to enable a strategic goal. So invariably, in presentation after presentation, the articulation of the PMO goals was assumed to happen after some sort of amorphous “strategy definition” stage. A PMO without a strategic framework to operate in was akin to a boat drifting without rudders. Where the cognitive dissonance was coming in was when we start thinking about those organizations where for one reason or another, strategy has not been articulated? Should we tell PMO’s in those organizations that they have no right to exist? Clearly there are organizations that haven’t figured out their own strategy. Equally clearly, PMOs exist within those organizations and provide value. So what is the role of the PMO in a company without articulated strategy? In essence, what is the role of the nonstrategic PMO? How does a PMO measure benefits realization when we don’t know what context the benefits should be measured in? The second answer is that the PMO may provide the input required to encourage the organization to articulate the strategy. As I’ve often maintained, governance may not be required in the absence of resource constraints. It’s only when resource (or process) constraints are identified that the organization has to begin making concrete decisions about values and project/portfolio prioritization – hence governance may be born (or at least parented) of constraint identification. Finally, there is something to be said about measuring how well the organization is meeting its desired outcomes. In the absence of true benefits realization, we function at the next lower level of abstraction, or the outcome level. This prompted me to think about the V Model, a key part of the ITIL training curriculum that’s been around for years. The V Model is properly read from the left arm, down to the base, and then back up on the right side. The general concept is that first we develop the Concept of Operations, then Requirements, then Detailed Design, then we build the system. After building the system, we move into validation mode, validating and testing each of the elements along the right side – corresponding vertically with the equivalent item on the left. So Integration, Test and Verification is a validation of Detailed Design. 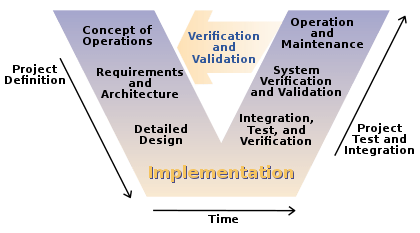 System Verification and Validation validates Requirements and Architecture, and so forth. How would a PMO of either the strategic or nonstrategic type fare against the V Model? As I see it, a strategic PMO starts at the very top left of our model and allows us to validate the benefits of the PMO against the defined organizational strategy. A nonstrategic PMO, on the other hand, will start at the next level down, and allows us to validate the results of the PMO against our desired outcomes, i.e. whether or not we are executing things correctly…..but not whether we are executing the correct things.